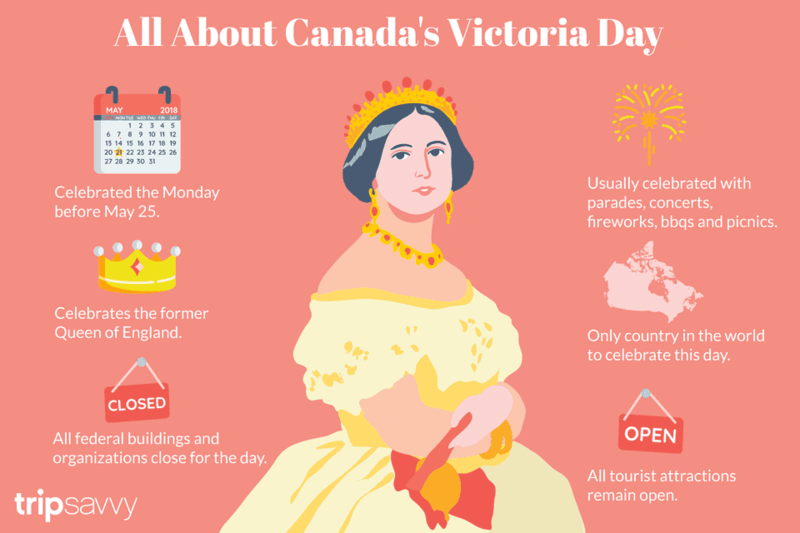 Canada has long celebrated Victoria Day, in honor of Queen Victoria of England, but the official holiday hasn't always been observed on the same day. In 1952, the Canadian government designated the Monday before May 25 as Victoria Day, meaning it falls between May 17 and May 24, depending on the year. In 2018, Victoria Day falls on Monday, May 21. A nationally observed holiday in Canada, Victoria Day also always falls on the Monday before Memorial Day in the United States. Residents of Quebec, however, celebrate the day as Journée des patriotes, or National Patriots Day. Victoria Day celebrates the May 24, 1819, birth of Queen Victoria, who ruled the British Empire from 1837 until her death in 1901; Canada introduced the holiday in 1845 during its days as a British colony. Interestingly, it's the only country in the world to formally celebrate the former monarch's birthday, despite the global reach of the 53-member Commonwealth of Nations. Until 1952, Canadians observed the day on May 24, unless that fell on a Sunday, in which case Victoria Day would fall on May 25. Communities throughout Canada celebrate Victoria Day with picnics, parades, outdoor concerts, and fireworks. Many families use the long weekend to go camping, host backyard barbecues, or otherwise get outside. It's also a popular weekend for sporting events, such as car racing in Clarington, Ontario; the Scotiabank Blue Nose Marathon in Halifax, Nova Scotia; and logger sports with ax throwing, log rolling, and tree climbing in Kaslo, British Columbia. At Upper Canada Village in Morrisburg, Ontario, you can get back to the holiday's source during an 1860s-style birthday celebration for Queen Victoria, complete with mock military maneuvers, historical speeches, and a singalong of "God Save the Queen." The authentic 19th century village also stages athletic games from the 1800s and serves birthday cake in the queen's honor. All Canadian federal organizations, such as the post office and banks, close in observance of Victoria Day. The Eastern provinces of PEI, New Brunswick, Nova Scotia, and Newfoundland/Labrador consider Victoria Day a general, rather than statutory, holiday but government offices and public schools still close. However, for many private sector workers in those provinces, business proceeds as usual. In all cases, it's best to call ahead and confirm holiday hours. Basically, all federal organizations close for the day, even in provinces that don't consider Victoria Day a statutory holiday. You can expect to find public schools, government offices, post offices, state-owned liquor stores, libraries, and banks throughout the country closed. Many grocery stores and service businesses remain dark in observance as well. Attractions operating in major tourism destinations throughout the country, such as the CN Tower, the Vancouver Aquarium, museums, public parks, and historical sites, remain open. Most public transit runs on a holiday schedule, and many retail businesses and restaurants in tourist areas remain open. Many convenience stores elect to operate at least for limited hours, and some garden centers stay open in response to the widespread cabin fever that prompts Canadians to get out and start working in their gardens.